It’s a bird, it’s a plane, it’s … wearing pants! 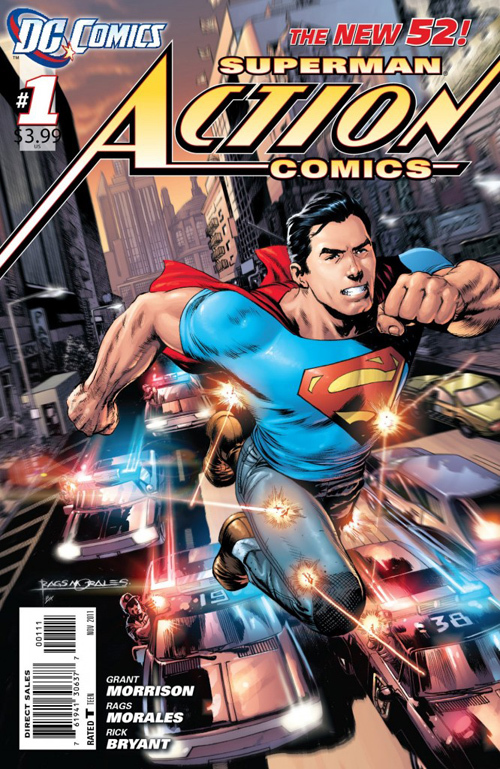 Action Comics #1, by Grant Morrison & Rags Morales, DC Comics, $3.99, out September 3. When DC announced that was going to start all its comics over from #1 in September, Action Comics was one of the shockers. It had been running continuously since the first issue that introduced Superman in 1938, second only to Detective Comics in the length of its run, so jumping from issue 904 back to 1 is a pretty big deal. Aside from a glimpse at the end of the previous week’s Justice League #1, it’s also our first look at what the revamped Superman is like after the linewide relaunch, so it’s been much anticipated. All-Star Superman. Have I mentioned that this was a great comic? 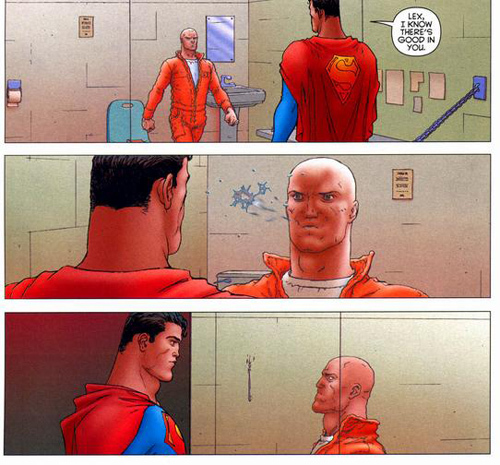 Grant Morrison wrote what may be one of the best Superman stories of all time in his fanciful 2005-08 limited series All-Star Superman, a series that was independent of the continuity of the time so that he could do pretty much whatever he wanted. 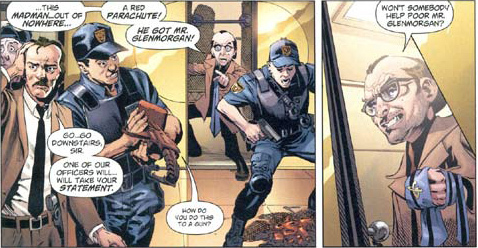 Now that DC is starting over with what appears to be a new continuity for some characters and not for others, one of things I’ve been most curious about is what Morrison would do with Superman if he got to rebuild him from the ground up, and that’s sort of what he’s doing in Action Comics, set at the beginning of Superman’s career. Now, this takes place a few years before the other comics coming out this month—earlier than Justice League, which itself is set a few years in the past. I’m not sure how many years, but for the sake of argument let’s say Justice League is set three years ago when various superheroes met for the first time, and Action Comics five years ago when Superman was just starting to establish himself. I don’t know if that’s actually the intended timeline—it could just as easily be 5 and 10 years for all I know—because it doesn’t say anything about it in the comic one way or another. That’s exactly the sort of thing that comics usually explain in a little caption box with an editor’s note at the bottom of one panel, but this doesn’t have anything like that. If this relaunch of the DC line is targeted at entirely new readers, you’d think they would want to make it easy to understand how things fit together, but apparently they haven’t really thought that through. Now Superman is the very first superhero again—a distinction he had when he was introduced in 1938 but hasn’t since the 1960s, when DC wanted to reintroduce its prominent heroes in the modern day but kept others in the World War II era. So in introducing Superman, Morrison really gets to introduce the heroic age. That guy up front is what comics are all about. With that in mind, it’s underwhelming. 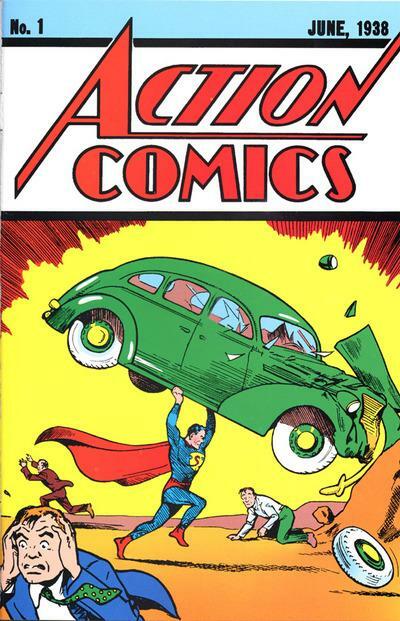 If you look at the incredibly, indelibly dynamic to Action Comics #1—not this one but the other one, from 1938—you’ll see that the guy in the foreground is freaking out. A guy’s lifting up a car behind him, and he’s never seen anything like it in his entire life. There’s really nothing like that in the new Action Comics. Superman’s new in town, but people have already had a chance to hear about him a little bit; they just don’t know how much to believe. Oh, and what you see on the cover is indeed what he wears in the comic. T-shirt, jeans, work boots and a cape, which makes the cape a much weirder fashion statement than if he were in his traditional full costume. But all in all, this outfit looks better than the Jim Lee redesign of his full costume that he wears in the other comics that take place a few years later, so it’s hard to complain much. Didn’t anyone teach you grammar? What were you, born in a space barn? Now, it seems like what Morrison is trying to go for here is bringing Superman back to his Golden Age roots. He can probably fly in the comics that take place a little later, but here he’s still leaping tall buildings with a single bound. He’s strong and fast and bulletproof, but he still gets bruised and banged up. When he stops a runaway train, it takes a tremendous effort and a whole lot of slowing-down space, and it makes his ears bleed profusely (ewww). But the big thing here is that he’s fighting normal folks. It took years for superpowered villains to appear in early Superman comics. 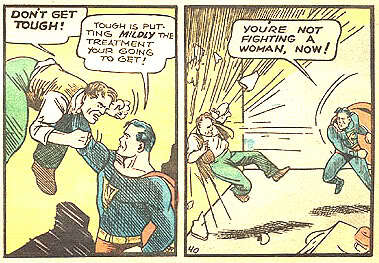 At first he fought gangsters, wife beaters and the occasional mad scientist like his eventual archnemesis Lex Luthor. And that’s what’s going on here, too: Superman is the only guy around with superpowers. Smack not, lest ye be smacked in turn. From the original Action #1. This sort of class resentment, however, is a new thing for Superman. It turns out that this guy’s crimes are paying illegally low wages, skimping on safety standards and bribing officials—all bad, but not the sort of thing you expect a superhero smackdown for. 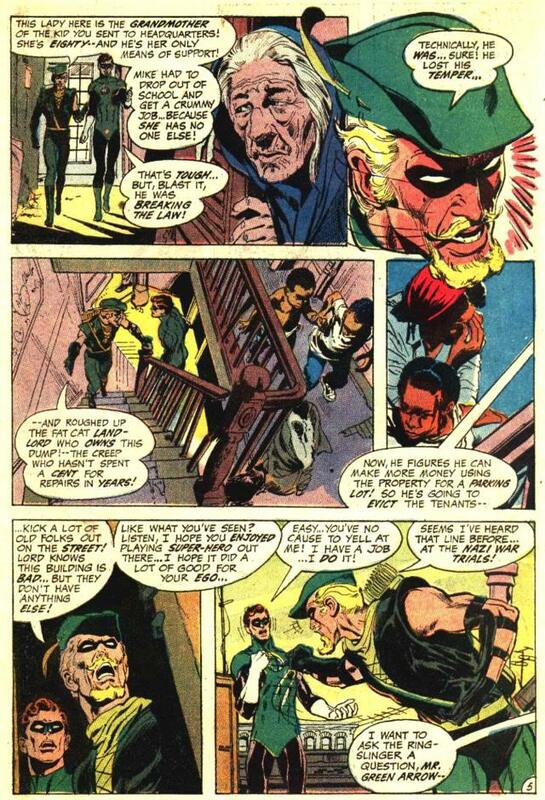 His actions here are much more what one might expect from Green Arrow in the 1970s, when Denny O’Neil reimagined him as a hotheaded liberal firebrand. Godwin’s Law, already hard at work in 1970. But from someone as powerful as Superman—even a powered-down, training-wheels Superman—it comes off as much more menacing, even bullying. There’s a reason why throughout his 73-year history Superman has been portrayed as an aw-shucks, good-natured boy scout. If he were not such a gosh-darned nice guy, he’d be terrifying. Even though this issue is reintroducing Superman, it doesn’t really introduce him so much as assume you already know him to some extent. It doesn’t get into his backstory, so we don’t know how much of it is intact, nor indeed if he even knows where he came from. We don’t even know if he was still raised by the same kindly couple or not. We gather that he’s a reporter in his civilian guise as Clark Kent, but this time he’s not working with Lois Lane and Jimmy Olsen but for a rival newspaper. Presumably some of them work for the Daily Planet, but we don’t know which. 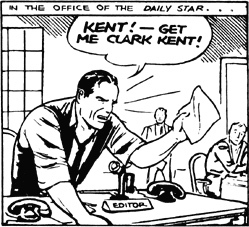 At some point Clark is on the phone with a guy named Mr. Taylor, however, and George Taylor was the editor of the Daily Star, the paper Clark and Lois were shown working at in the original Action Comics until 1940, when it suddenly changed to the Daily Planet. Right, that guy. Don’t call him Chief either. So my guess is that Clark works for the Star and Lois and Jimmy for the Planet, but that’s just a guess. For all that this is an update of Superman to make him younger and more identifiable for new readers, Morrison is clearly drawing heavily on the 1940s comics for inspiration. Lex? He’s just this guy, you know? Lex Luthor shows up too, but at first he’s so unassuming that I thought he was just some random bald guy. It doesn’t help that penciller Rags Morales doesn’t give Luthor the intensity that really makes him identifiable. We don’t get much of an introduction to Luthor either. 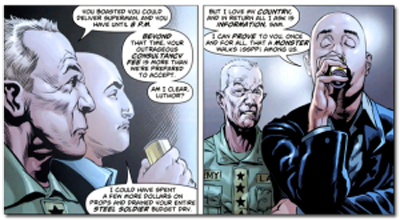 We don’t glean much about his wealth, genius or social standing, just that he’s contracting with the military to try to bring Superman down because he considers him an invasive non-native species. There are some curious nods to old Superman villains—a henchman called Mr. Grundig (as in Solomon Grundy) and Clark’s landlady is named Mrs. Nyxly (like Mr. Mxyzpltk). I very much doubt that these characters will turn into anything like their near-namesakes; they just seem added for flavor. I don’t get why he’s stealing the guy’s tie either. Morales’s art is dynamic enough but sometimes confusing. A freaked-out business associate of the guy Superman’s terrorizing suddenly gives a grin like Superman’s attack is all part of his fiendish master plan as he ducks into an elevator that appears to have a doorknob on the inside. It’s hard to know what to take from that—probably just that he didn’t like this guy much anyway, but the expression comes off way more sinister than that. And who knows, maybe in Metropolis elevator doors have doorknobs. It could happen. All in all, it’s a decent issue that feels more like a #2 than a #1. I have problems with it as an introduction, because it doesn’t really introduce anyone. They’re just all already around. Superman doesn’t encounter Lois or Lex, and we don’t know if they’ve met or not. 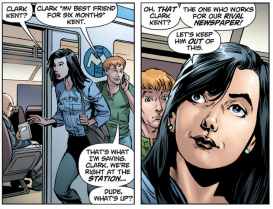 (Clark is at least professionally acquainted with Lois and Jimmy, though we haven’t seen them together.) Certainly more happens in it than in Geoff Johns’s Justice League #1, and it has a heartwarming moment where the ordinary citizens that Superman’s just saved try to protect him from the armed forces. Ordinary people are the superest people of all. I’m certainly on board with it as a comic that I’m curious to read more of, but it hasn’t done much to really grab me so far, and when you’re starting afresh that’s really what you want to do right at the outset.